Please note that some information in this article has been superseded. 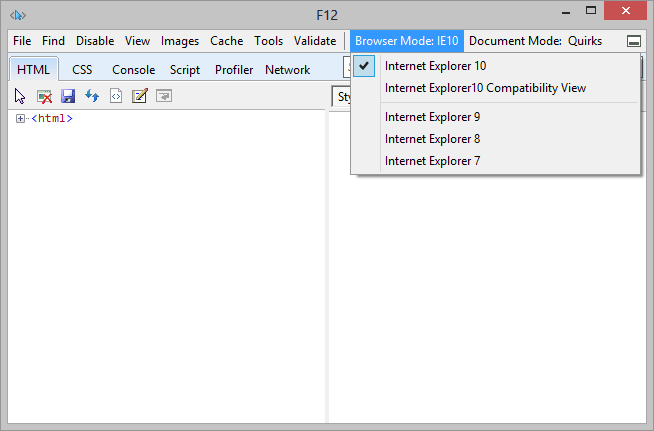 Please see IE11: Browser Modes Return. Web developers give Microsoft a tough time. “Follow W3C standards”, we shout. “Force everyone to upgrade their browser”, we screech. “IE ate my kitten”, we bellow. Some criticism was deserved. Microsoft abandoned their flagship browser, held back web evolution and they still take too long to release new versions. But, if we ignore the abomination that was IE7, the company has significantly improved Internet Explorer during the past five years. IE8 and a few shims remain adequate for all but the most sophisticated applications. IE9 won’t cause many issues unless you’re after CSS3 animations. IE10 is a solid alternative to any of the competing browsers. You’ll still find issues in IE (please Microsoft — add transform-style: preserve-3d;), but you’ll find issues in every browser. None are perfect. Those who rant loudest usually find it easier to blame Microsoft than fix cross-browser issues in their own code. IE11, to be launched with Windows 8.1 on October 18, 2013, finally includes WebGL and a great set of developer tools. You can install it today if you’re an MSDN subscriber (thanks to a little back-tracking on Microsoft’s previous decision). A version for Windows 7 will arrive a few weeks later. However, one missing feature will incur the wrath of developers everywhere: browser modes have gone! The developer tools in IE8, 9 and 10 provided an increasing number of browser rendering modes going back to IE7. The modes were added following compatibility outcries after IE7 was launched in 2006. The browser fixed several of the quirks and proprietary technologies developers utilized in IE6 so many applications broke following a browser upgrade. Browser modes was a solution which allowed companies to continue using legacy applications while they fixed the problems. An HTTP header or meta tag could force newer editions of IE to act like previous versions. Browser modes were a temporary fix for a specific purpose; not application testing. Browser modes should die. There were radical differences between IE6, 7, 8 and 9 but far fewer between IE9, 10 and 11. It shouldn’t be necessary to test older browsers in a world where users upgrade automatically. You don’t test Chrome 23 or Firefox 17; IE should be no different. Don’t bother testing IE8. Google doesn’t. With luck — and a little careful coding — your site will degrade gracefully much like any other aging browser. Use a browser rendering service such as BrowserStack, BrowserShots or NetRenderer. These are good for rudimentary cosmetic testing. Test your site in real installation of IE8. You need not buy another PC; Microsoft provide free virtual machines for Windows, Mac OS and Linux at modern.ie. But please don’t be tempted to retain IE10 or use registry hacks to re-enable browser modes! They’ve always been flawed and lull you into a false sense of satisfaction. The sooner people upgrade, the sooner we can abandon ancient browsers.